(Nanowerk News) Researchers at the Nanotechnology Research Institute at the National Institute of Advanced Industrial Science and Technology (AIST), in collaboration with Yamagata University, have succeeded in producing gel electrolytes for use in a light-control glass device using nanoparticles of Prussian blue-type complexes. The light-control glass device is based on the electrochromism phenomenon, and its color can be controlled between blue and transparent states by application of an electric current. As nanoparticle-containing electrochromic layers, a gel electrolyte layer, and a sealant could be fabricated by application processes, simplified manufacturing processes will permit the efficient production of large-area light-control glass devices at a low cost. Adoption of the gel electrolyte would reduce the possibility of leakage of the electrolyte, should the device be damaged. Furthermore, the new light-control glass has a nonvolatile property and the color remains unchanged when the power supply is switched off. 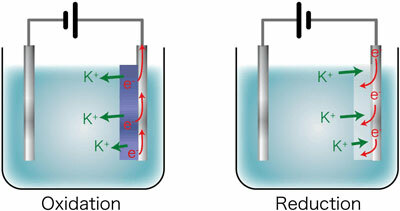 Gelation of an electrolyte generally decreases its ion conductivity, thereby reducing the operating speed of electrochromic devices incorporating the gel electrolyte. By optimizing the combination of materials used and their formulation, we succeeded in producing a gel electrolyte that retains its response rate. Furthermore, the use of a combination of a plastic gel electrolyte and a resin substrate (polymer film) enables the production of flexible electrochromic devices. If titanium oxide powder or other white particulate material is mixed into the gel electrolyte, the device can display only a color change on one side of the device. Such devices with a nonvolatile property could be used as energy-saving display units including electronic paper. The use of light-control glass with an adjustable color and light transmission has recently received considerable attention as a means of improving the efficiency of air-conditioning systems. However, the light-control glass that is commercially available at present are expensive, which discourages its widespread use. To reduce the price of light-control glass, it will be necessary to cut both the material costs and the manufacturing costs, and to improve the yields of the light-control devices. It is also required to reduce the energy consumed in adjusting light transmittance. Electronic paper is a color-controlling device as light-control glass. It uses a reflection-type display device that does not require a continuous input of energy to maintain displayed information. Electronic paper units utilizing electrochromic materials are thought to have advantages including low production cost and high contrast. As a result, they could become widely used in the future as an alternative to a paper medium that is consumed on a large scale. With a focus on the electrochromic properties of Prussian blue-type complexes, AIST and Yamagata University have promoted research on the fabrication of Prussian blue-based light-control devices. Prussian blue is a well-known pigment that has been widely used for a considerable time. Nanoparticles of Prussian blue, formed from the pigment, have been made into ink to produce a low-cost light-control glass that can be manufactured by printing (AIST press release, August 8, 2007). The light-control glass changes its color by an electric current. It consumes power for the change; however, the resulting color is retained without further power consumption. In other words, the glass has a memory for chromatic change. This light-control glass requires an electrolyte and a liquid electrolyte was used. However, the process for incorporating the liquid electrolyte into the light-control glass is inappropriate for efficient large-scale manufacture. In addition, it is possible for the liquid electrolyte to leak from the device when it is damaged. For these reasons, we began research on a gel electrolyte that can replace a liquid electrolyte while maintaining the performance of the light-control glass. A part of this research was conducted jointly with Hitachi Chemical Co., Ltd.
Light-control glass containing Prussian blue nanoparticles is a device that makes use of electrochromism, i.e., a phenomenon in which the color of the material changes between blue and colorless transparent states when the Prussian blue complex is reduced or oxidized, respectively, through the application of an electric current. In addition to the transfer of electrons that is associated with oxidation and reduction reactions, a free transfer of cations, such as alkali metal ions, between the complex and the electrolyte is needed to ensure that electrical charges are balanced to maintain the oxidation/reduction status of the complex (Fig. 1). Figure 1: Schematic showing the transfer of electrons (e-) and cations (potassium ions, K+) in the electrochromic reaction. The response rate of the electrochromic device is increased by increasing the rates of transfer of electrons and cations. Consequently, means for promoting electron and cation transfers are key to realize the electrochromic devices with performance at a practical level. In general, gel electrolytes show reduced ion conductivities and, consequently, decreased rates of cation transfers, resulting in decreased response rates of electrochromic devices containing such electrolytes. In this research, we optimized the combination of the supporting electrolyte, the plasticizer, and the polymer, as well as the formulation of these components, to give a light-control glass with a gel electrolyte that has almost the same response rate as one with a liquid electrolyte and a nonvolatile property. Figure 2 shows a structural drawing of the gel-electrolyte light-control glass device (left), and photographs of the actual color change of such a device (center and right). An electrochromic layer (EC I) containing Prussian blue complex was applied to a transparent electrode of indium tin oxide (ITO). A second electrochromic layer (EC II), containing a nickel-substituted Prussian blue complex, was applied to a second ITO electrode. The gel electrolyte was sandwiched between the coated faces of the two ITO electrodes, and the perimeter of the device was sealed with a resin. Because the viscosity of the gel electrolyte was about 30,000 to 100,000 mPa?s, the electrolyte between the two substrates was almost solid. When a 1.5-volt dry battery was connected to the electrodes of this device, with the EC I layer connected to the negative terminal, the color of EC I layer changed from blue to colorless and that of the EC II layer changed from colorless to pale yellow within 3 seconds (25-mm-square device). The overall color of the device changed from blue to transparent. When the voltage was reversed, the overall color returned to blue as a result of the reversal of the chemical reactions. The application of a current was needed only to change the color, and the resulting color was retained even when the current was switched off. The performance of the color-control glass device showed barely any deterioration even after 10,000 or more cycles of color change. Furthermore, when the operation of the device was tested over the temperature range from ?20 ?C to +100 ?C, the glass operated without any problems, but required a longer operating time at lower temperatures. Figure 2: Structure (left), blue state (center), and colorless transparent state (right) of gel-electrolyte light-control glass. The gel-electrolyte light-control glass was prepared by a bar-coating method shown in Fig. 3. 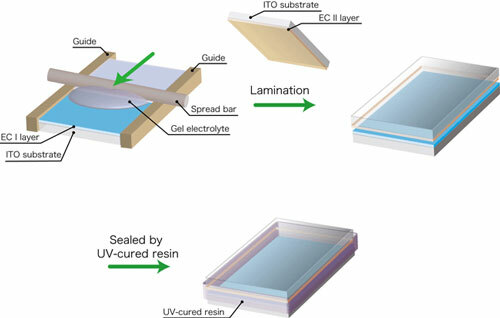 In this method, guides with a thickness a little greater than that of the substrate with its applied electrochromic layer are placed on both sides of the substrate, and the gel electrolyte is dropped on the substrate and spread by using a bar. The method is suitable for large-area application of a gel electrolyte, but cannot be used for conventional liquid electrolytes. Liquid electrolytes require a process in which the two substrates with the EC layers are bonded together with a sealant, and an electrolyte is then introduced into the space between the substrates through a small hole in the sealant and spread by capillary action. The use of a gel electrolyte makes the manufacturing process substantially more efficient. Figure 3: Production of the light-control glass using a bar-coating method. An ITO glass substrate is currently used as the base material. 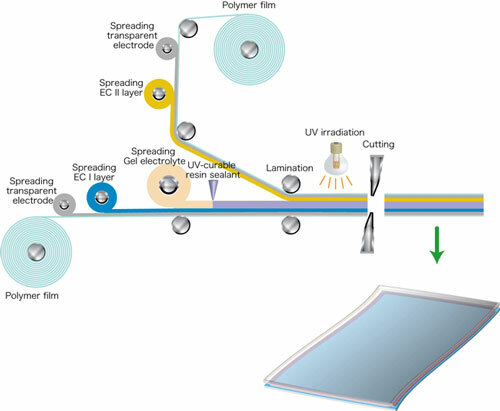 In the future, the use of a polymer film substrate with a transparent electrode should permit the manufacture of large-area light-control films by a roll-to-roll process, as shown in Fig. 4. The use of light-control glass has not yet become widespread because of the high price of such devices. Our new technology, which reduces material and manufacturing costs and facilitates the production of large-area devices, would allow us to prepare light-control films that could be stuck on existing windowpanes, thereby permitting much more-widespread adoption of light-control devices. Figure 4: Process for manufacture of light-control film by a roll-to-roll method. The developed electrochromic device, in addition to being used for light-control glass, can be used as a display device. An electrochromic device was fabricated by incorporating white powder, such as titanium oxide powder, into the gel electrolyte to form a reflecting layer. The rear electrode (EC II layer) of the device cannot be seen. Figure 5 shows the structure of the prototype device, and photos of the colored and colorless states. The white electrolyte layer allows the color to be changed between blue and white. As this device has a nonvolatile property, it is expected that the device is useful as an energy-saving display device for electronic paper etc. Figure 5: Structure (left), colored state (center), and white state (right) of a display device containing white powder. Our aims are to produce a prototype light-control device with a polymer film substrate, to conduct light fastness tests on the light-control devices, and to perform research and development on element technologies for light-control glass and films that can be used in homes and in automobiles. Our aims also include sample shipment of the new devices in the near future. Aiming at the application of the device in electronic paper etc., we will conduct research on the technologies that are needed to form a matrix of electrochromic devices with a gel electrolyte as a white reflective material.